Let’s get crafty this season! Crafting isn’t always time consuming or difficult. 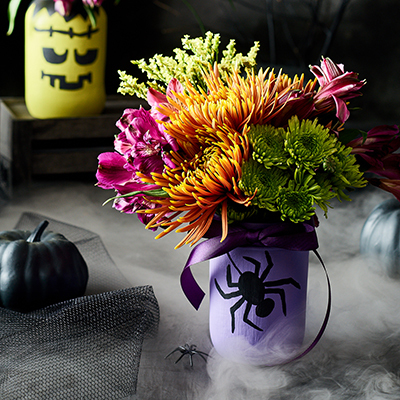 Start a new Halloween tradition by making these festive crafts to use as home décor for years to come. 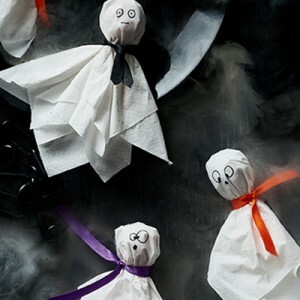 If you’re hosting a Halloween party, these crafts are quick, easy and fun to make. We’ll take you step by step through each craft to make sure you have the best creepy, crafty holiday this year. Put your own spin on jack-o’-lanterns this year. Turn a simple glass jar into a flower vase. Use paint, markers, stickers and ribbon to decorate using your own creativity. We offer fall-inspired arrangements, so don’t forget to pick up yours in your local Produce department. 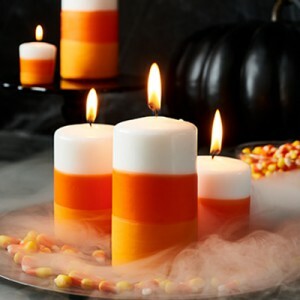 Make your own candy corn-themed candles using common household items. These are a great decoration for any Halloween party or table spread. This one is an easy way to add the traditional yellow, orange and white colors to your home. Create fun disguises for your lollipops to surprise your neighborhood trick or treaters! Ghost pops are easy to make, so grab a bag of your favorite lollipops. If you’re having a party, this would be great activity to have for the kids. Already have food and decorations planned for Halloween? Leave the party favors to us. 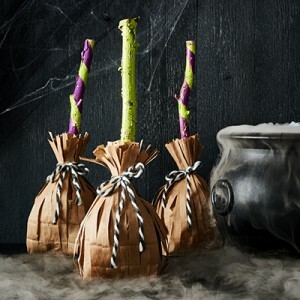 These witches’ brooms filled with treats are a cute way to hand out candy to your guests. Which creepy craft are you planning to make this year? For more inspiration including food and drink recipes, check out our Halloween ideas page!